E-VideoSeminars® - using the latest technology to stream internet-based, affordable, high-quality Video & Audio, along with PowerPoint® slides and a Q&A capability! It's almost like "being there" in-person, but at a fraction of that cost. We can even provide Closed Captioning for the hearing impaired! Save time, travel costs and multiple location facilitation fees! Our E-VideoSeminars® can be streamed from TTG's offices to multiple training/conferencing locations anywhere in the world. When projected on a screen or white wall, it's like in-person facilitation. Some internet-based "web-inars" offer only slides (no "live" video) with telephone audio (no internet-based audio). 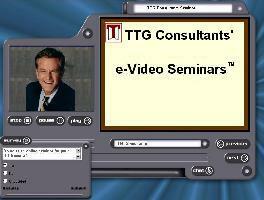 Not TTG's E-VideoSeminars®! We feature near-television quality, on-line, "live" facilitation, with accompanying PowerPoint® slides and an interactive capability to answer participants' questions. E-VideoSeminars® can be any length, on virtually any subject. To see and hear this cutting-edge technology, click below.